My husband is moving to Somerby of Mount Pleasant on Monday. It was very clean, and they seemed to have a very caring atmosphere. The staff was great and very accommodating. The rooms are adequate. You can have a regular room, or you can get a deluxe room which has a few more feet and you can get a little more furniture in there. Thank you for taking the time to share your thoughts. We look forward to caring for your husband as part of our Somerby family! Somerby had a separate facility for assisted living. The staff was very efficient and polite. The residents I talked to seemed very upbeat and polite. At Somerby of Mount Pleasant, the staff was very informative and took plenty of time to answer our questions. They took us through some rooms, which were wonderful. I was able to speak with different people and got their opinion of the place. One lady spent time with us to tell me how wonderful the place was to her. We made a trip to South Carolina to Somerby; we were very pleased, and we liked it very much. The staff was all very polite and accommodating. We ate dinner there, and it was excellent. What we saw we liked very much. They were very spacious and well-landscaped, and we liked the color combinations. Everything was very neat and clean. It was a safe, well-maintained environment, and the people were very courteous. The community was attractive looking. My in-laws are in Somerby, and I am very happy with them. The food was very good. They do exercise and take them out to places. They are accommodating and friendly. They are happy and comfortable. I thought it was really nice and well-maintained. I would absolutely recommend the place. I didn't like that place. They had a lot of old people. It was setup as a convalescent home. Then they started opening up rooms for more people with more problems. I didn't stay there very long to know the staff. I just walked into the place and kind of decided it wasn't for me. Somerby of Mount Pleasant is beautiful and it is clean. I didn't taste the food or anything, but the restaurant looked nice. They have a nice pool. I liked the idea of the cottages, which were kind of outside the apartments and the assisted living. They had these cottages around the property that you can live in, and although they are more independent, you can still have access to services. So I went and showed that to my parents, and they liked that option better than the apartments. I was very happy that when my husband and I got ready to leave after we visited Somerby, we felt like it was more like a spa. It was so put together and clean. They have a lot of activities that I know would interest my parents. I think it would keep them very busy -- if they wanted to be busy with socials. They have everything that they would need. I think that the rooms are set up very well especially for my folk’s ages, everything from the call button on up. They like to know when my folks would come and go. It just lets me know that they care enough to know their whereabouts. We really thought it was a top notch place. That would be my first choice. My sister has been a resident about nine months. She was in independent living until three weeks ago, when she moved into assisted living. She has always enjoyed the meals and recently mentioned that the staff members are all very nice. I find the range of services excellent - more extensive than she is inclined to ask for. I have peace of mind that my sister has the care she needs and sufficient opportunity to form relationships with the other residents. My family and I have. I am a big fan of Somerby and I believe that they take A+ care of my mom. The facility is nice with good dining facilities, exercise rooms, on site Health Care services for the occasional times when my mom needed a little extra help. The apartment is roomy and comfortable. Somerby also offers endless services for its residents including by not limited to shuttles to her doctors, shopping and other entertainment things. The facility also is organized so that I get all the calls and management issues and alerts seamlessly. Next of my “like” list are the friends that she has there to encourage her to get out and exercise. And if the above wasn’t enough, my staff experiences have all be friendly, nice and helpful. Bottom line for me is that I am far away but know that she is in good hands. The staff at Somerby of Mount Pleasant is very good. We have a very good relationship. My mother seems to be one of the popular residents, there seem to be always someone around, and she is well taken care of. They are just really very expensive. It is very convenient for us; we are about 5-minutes from there. They seem to be very active with the residents, taking them to different places and stuff like that. I toured Somerby of Mount Pleasant. It was lovely; however, it was very costly for me, and I don't think we could keep it up. The food was very good. I thought it was a very nice place. The people all seemed lovely. I would recommend this community. However, they did not have assisted living available, only independent living. The staff seemed very nice. I was in a group for tour, so we had lunch there together and saw a presentation. It was very informative and nice. Thank you for visiting us! We are glad you enjoyed the meal and ambiance! We do have assisted living and memory care. The apartments become available throughout the year. We are confident that we could find the perfect fit for your budget. We hope you can visit again soon! Somerby was very nice. The rooms were very nice, and we saw the independent villas, which are what we want. The facilities, decor and the whole layout were excellent. The personnel was very nice, very gracious, and explained everything. I thought it's a good value for what you’re getting. The food was good. We prefer the villas of Somerby because it is more like where we live now, and it would be more like independent living, but we would only get one meal. So we've been talking about if we would go there, we would probably do an apartment where we would get two meals a day. But we liked the villas very much. The apartments were very nice, but the balconies were way too small, and my husband is an outside guy, which was one of the deterrents. People were very friendly, it seemed to be very well-run, and there were lots of interesting activities for seniors. It was well located near grocery shopping and other shopping. We haven’t decided to move there yet. It doesn’t meet all of our needs yet, but we liked it the best of what we saw and what we could afford. I've been to Somerby before. Everything was nice about it. For me, it was just the distance. It's a beautiful facility though. The staff was wonderful. When I went there, my mother was independent, and independent is entirely different. They had artwork. They seemed to have a lot going on. I was impressed with what I saw. History, Southern charm and natural beauty abound when you live at picturesque Somerby Mount Pleasant. Minutes away from everything you love in Mount Pleasant, and also close to Charleston, SC, Somerby offers choices that few senior communities in this area can match – from formal or casual dining, on-campus entertainment and recreational classes to activities and social opportunities. In addition, you’ll also find that Somerby combines culture and environment conducive to healthy living, thanks to an innovative approach to wellness — Discover Your Spark® that’s rich in opportunities for lifelong learning and discovery. 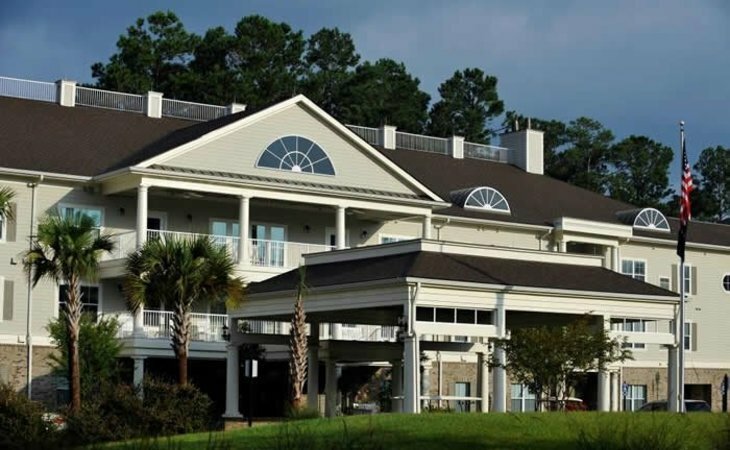 We invite you to come and learn what our Residents and Families in the Charleston area have already found about the gracious and active lifestyle at Somerby Mount Pleasant. All of our Independent Living apartments have 9 foot ceilings and washer/dryers. Assisted Living and Memory Care have multiple RN's as well as 24/7 LPN's. What should caregivers and potential residents know about Somerby of Mount Pleasant?